Scooty Pep Plus a refined scooterette from the TVS workshop was brought into the market after addressing some of the complaints of its previous version Scooty pep. This version available in market today is brought in style with some feminine pleasing graphics and a wide range of colors that can only be sensed and picked by a female as an indication of both taste and identity. With some additional features like a mobile charger port, puncture resistant tubeless tires and storage space under the seat, Scooty Pep Plus is all ready for a babelicious ride. TVS Scooty Pep Plus a scooterette for the gearless segment has an 87.8 cc single cylinder engine under the hood. The air cooled engine which uses a Capacitor Discharge Ignition system has a maximum torque of 5.8 Nm at 4000 rpm. This torque is best suited for a comfortable handling in busy city roads. It can deliver a maximum power of 5 bhp at 6500 rpm which is enough for two average weight Indians to travel on. The best performance of the engine is delivered at economy mode. The scooterette can touch a maximum speed of 75 km/hr. Scooty Pep Plus has come up with a wonderful design outline. The dual colored body of the scooterette has the rear view mirrors matching the base color. Graphics of flowers on the body strike the feminine taste buds. Soft and wide seats with a single suspension support on rear ensure a comfortable ride. TVS Scooty Pep Plus is available in few basic colors and also in 99 color options to suit the taste of the rider. 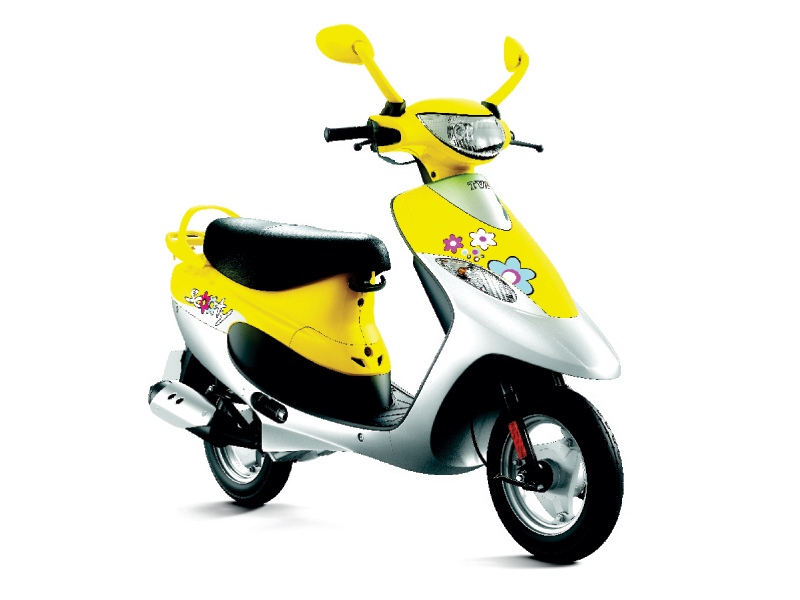 Scooty pep plus is a feather like two wheeler driven through Continuously Variable Transmission from an 87.8 cc engine. The tubeless tires coated with a sealant gel from inside withstand sharp and uneven materials on road protecting the tire from puncture. The shock absorbers on front are of telescopic type and use a hydraulic fluid to absorb shocks from wheel. The lower wheel base makes the scooterette easy to handle in cities. 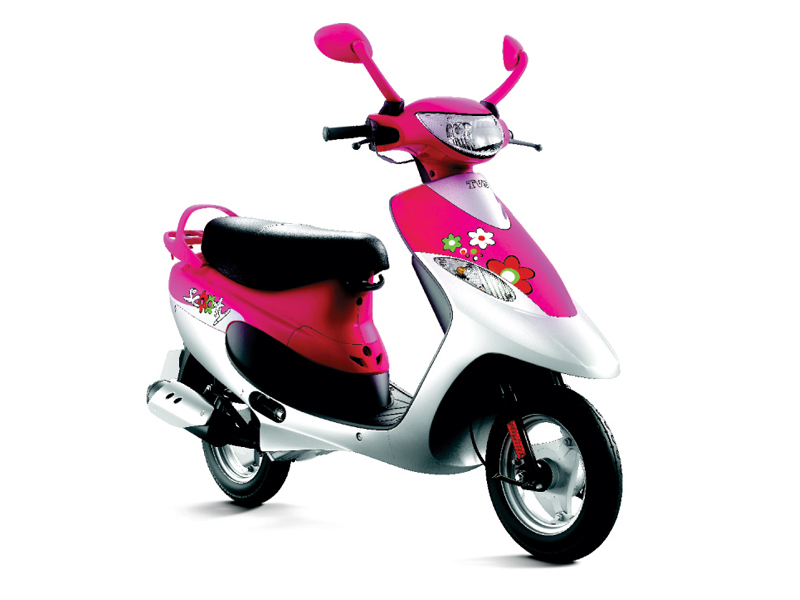 The feminine scooterette is expected to give a mileage of 40 to 50 kms per liter of petrol when driven in economic mode. TVS Scooty Pep Plus is available in five basic colors out of which two are the fashion series. Night Black, Purple Mischief, Electric Red and Perky Pink and Mystic mauve from the fashion series are the basic colors. There are other 99 colors of this scooterette that are offered as options. The price of Scooty Pep Plus in New Delhi is about Rs 36,900. Conditions do apply over this price and it is not the on road price tag.